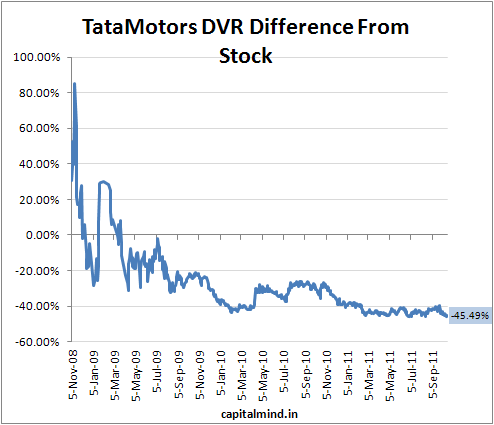 Chart Of The Day: How far is Tata Motors DVR away from the stock? Note that there is no need for “convergence” – for the two prices to come together. The only difference is liquidity and the lower voting rights. If you’re looking for hte obvious arbitrage – short futures and long the DVR – you may be in for a really long wait if the two prices don’t converge. On the other hand, the dividend yield is nearly double the Tata motors yield just because of the price difference. But hey, would love your thoughts.